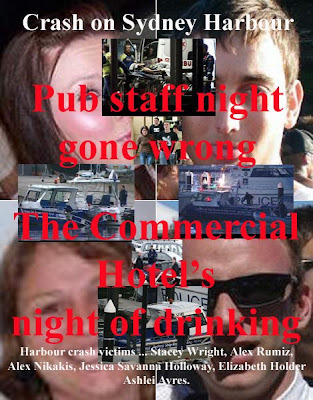 POLICE investigating the collision on Sydney Harbour that killed six young people in May have asked for charges to be considered against a bartender, Percy Small, in a brief of evidence handed to the Director of Public Prosecutions on Friday. After an investigation of 2½ months, police yesterday said that Mr Small was allegedly driving the runabout when it collided with a fishing trawler. Mr Small, 24, had worked at the Commercial Hotel, Balmain, with other crash survivors. It is understood a charge of dangerous driving occasioning death is possible. However, now Mr Small who it is alleged has refused to do a formal interview with police over the crash, which occurred early on May 1. Contacted through his family yesterday, he refused to comment on the investigation or who was driving the boat when the crash occurred. It is understood he has told police he was not driving the boat. Mr Small was part of a group that climbed aboard the runabout at Darling Street wharf, Balmain. They had planned to take the boat to Watsons Bay and back but collided with the trawler Jordon's just off Bradleys Head about 2.30am. At first attention focused on Matthew Reynolds, 31, who had taken [stolen] the runabout out for the night. While he has also refused to be interviewed by police, he recently agreed to nominate who he says was driving the boat when it crashed. It is believed he nominated Mr Small. The Homicide Squad's coronial investigation team is allegedly awaiting several biomechanical reports on the injuries sustained by those on the runabout. The types of injuries and their locations will [allegedly] help police establish where each person was on the boat when the accident occurred, and if that matches their statement. The DPP's office confirmed that it had received a "partial" brief but was still waiting for more evidence, believed to be the biomechanical tests. The DPP will [allegedly] assess the evidence [given to them by police] before giving police advice on whether a prosecution is likely to succeed.